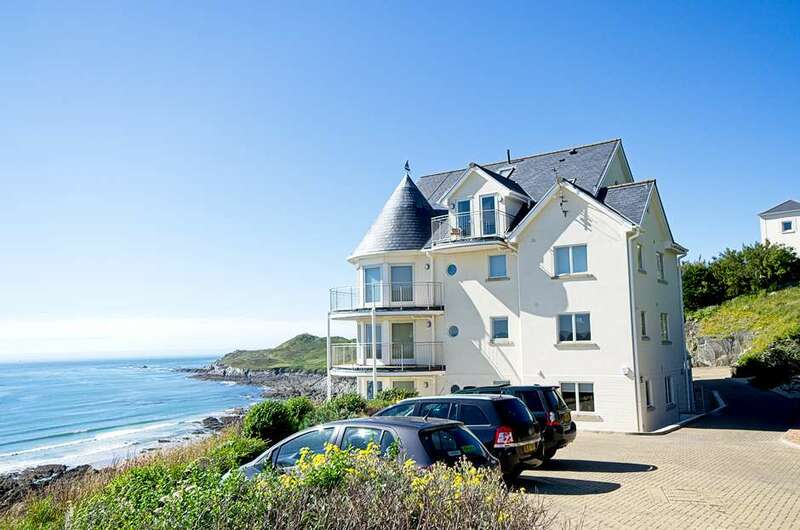 This outstanding apartment commands far reaching, uninterrupted views as it is positioned on the cliffside of the northern peninsula of Woolacombe Bay, hence having a predominantly southerly aspect. This is one of the penthouse apartments in a very prestigious development called Castle Rock, built on the site of the former nursing home of the same name and is about 10 years old. There is a lift from the main entrance and once inside the apartment the high vaulted ceiling helps give this penthouse its unique feel. The balconies on two sides of the large main open plan room have glass patio doors filling the room with south westerly light – spectacular! A red leather suite, coffee table, Digital TV, dining area and kitchen all form the contemporary style. From this room an open tread spiral staircase leads to the mezzanine (no door) bedroom with double bed and porthole window. The other double bedroom has a king size bed and is built into the eaves allowing useful storage for clothes, Hoover etc. and the open eaves provide an ideal spot for the two cots if needed. Another delightful porthole window provides natural light but is not seaside. There is also a skylight window above the bed. Please note that due to the apartment being built in the roof area the bedrooms have restricted headroom, quirky and interesting but must be pointed out none the less. The kitchen area has slimline dishwasher, washer dryer, microwave, fridge and freezer, range style Smeg stove and hood. There is a modern family bathroom. There is Wi-Fi in the building. Castle Rock is situated directly on the South west coast path and just 10 minutes either way to a National Trust natural beach. Grunta and Combesgate both have surf, sand and rock pools and are great for a picnic or evening BBQ watching the sunsets – idyllic!!! One car parking space is included in the cost of your booking. However, if you need/wish to bring a second car please advise on the booking form and there will be an addition £50 charge added to your booking. The villages of Mortehoe or Woolacombe are either a 15/20 minute walk away or a short ride in the car. This place really does tick all the boxes for a discerning holiday midway between the two villages to take advantage of arguably the best view in the resort.